Across Arkansas, plywood propped on porch steps and other makeshift ramps bear quiet witness to a looming crisis: the baby boomers are graying, and conventional homes don’t cut it when housing older adults and people with disabilities. Steep steps, narrow passageways and bathrooms without grab bars undercut aging at home, which is precisely where most boomers plan to enjoy their retirement. A model of a home that uses a wrap around porch to function as an access ramp. A recent survey funded by the Universal Design Project, an outreach program of the UA School of Architecture, found that an overwhelming 95 percent of boomers believe that they will maintain an independent lifestyle, although 81 percent acknowledge that their health will decline as they age. Picture this: the number of people over 65 is expected to double in the next 25 years, and disability rates will rise as the boomer generation ages. Nursing home care, at more than double the cost of independent living, is not the answer. The need for low-cost, accessible housing is especially urgent in Arkansas, which has the nation’s highest poverty rate, the third highest disability rate, the fifth highest percentage of Social Security disability recipients and the seventh highest percentage of residents 60 and older. Kory Smith envisions a brighter future based on good design. With the help of five architecture students and colleagues across campus, he is taking the first steps to create affordable, accessible housing in Arkansas. Kory Smith stands in front of a prototype of a movable wall unit that also functions as a wardrobe. Several of the department’s model homes are shown in the shelves of the wardrobe. The survey is just one of many projects simmering in his lab, a sunny spacious room in Vol Walker Hall crammed full of site models, wooden house blocks and housing prototypes. During a recent interview, Smith examined one of the prototypes, a white single-story house with the granular look and feel of a sugar cube. Crafted by a rapid prototyping machine, a printer that lays down increments of powder and a glue-like ink, this model for a 1,000-square-foot home in Arkansas City is the most cost-efficient design developed by Smith and his students. To explore this and other design questions, Smith and four students canvassed the state last summer. They snapped more than 600 photos of regional housing styles and ad hoc ramps made by residents to accommodate disabilities. Ultimately they focused on developing designs for sites in Fayetteville, Hot Springs, and Arkansas City that represent three geographical regions in the state. Take the Delta project: Though Smith and his students try to avoid ramps, which can carry a certain stigma, in this design they wrestled a necessity into an asset, wrapping the ramp around the home and turning it into a porch that “faces a soybean field, the levy and the Mississippi river — it’s very scenic,” Cooley said. The other models take advantage of sloped sites to provide level access and introduce two additional housing types: a two-story duplex with live/work space and a larger single family home. 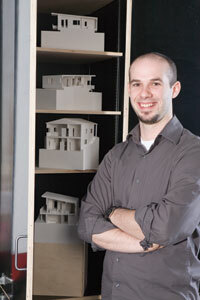 Darell Fields, a UA architecture professor with expertise in prefabricated housing, is developing a multi-family unit. All of the prototypes use common sense solutions for accessible, low-cost shelter. For example, kitchens and bathrooms share a “wet wall” to save on plumbing, and interior load bearing walls are limited to allow for design adaptations as needed. Smith hopes to begin construction on the prototypes by the end of next summer. While design work on the prototypes is well under way, Smith’s team continues to research the assumptions and preferences that shape the current housing market. On the boards for this spring is a competitive bidding study that will compare blind bids from contractors on two house plans: one inclusive, one conventional. “An inclusively designed house shouldn’t be any more expensive to build. If contractors and builders think otherwise, then we have to find out why,” said Brent Williams, a professor in the UA rehabilitation education and research program. Williams believes that any cost difference would be minimal — and that inclusive homes will have a market edge as the population ages. He would like to host forums with builders and contractors to pinpoint areas of resistance to inclusive design and how to overcome them. “I’m guessing that it’s the association with age and disability. We have to convince them that inclusive design isn’t just for a specific market niche. Our task is to show them that it’s just good design,” he said. Williams points to airbags in cars as an example. “Used to be, you didn’t care if your car had airbags; now, you expect them. We want people to expect doorknobs that work, hallways that are wide enough, bathrooms that are big enough.” To effect policy change, Williams also plans a landmark study that would compare costs of assisted living in an inclusive design environment with long-term nursing home care. The study would take twenty nursing home residents and place them in retrofitted apartments, providing assistance from existing community resources. A rendering of a two-story home with one story functioning as a residential area and the second as a business, with both having direct access to the street. “We’ve already established what the state has been spending on nursing home care — up to $5,000 a month. The attendant care necessary for someone to live at home runs around $1,300 a month — that’s a savings of a little over $44,000 a person per year. It’s a win-win for everyone; the state’s happy because they’re saving money and people with disabilities are happy because they’re living at home, in the community,” Williams said. “What we deal with is the health, safety and welfare of the end user,” she said. “It’s important that the person has enough room to do what they need to do, in an assisted way if that’s necessary, and that psychologically, it fits them.” To design interiors that provide a good psychosocial fit, they are developing an environmental preference study that will be administered by agricultural extension agents to groups of people around the state. Participants will be asked to rate images of kitchens and sofas, bedrooms and neighborhoods to determine which feel most comfortable. “What’s home to me as a middle-class white woman from eastern Tennessee may not be home to a baby boomer who is African American and lives in the Delta,” said Webb. She and Miller hope that their findings can be used to create sensory-rich environments that reflect the history, culture and values of the homeowner. “If we come up with research methods that could be replicated elsewhere, then that is priceless as well,” Webb said. To share the prodigious amount of research being generated by the Universal Design Project, Smith is compiling two books. The first is a “how to” manual for builders and contractors that charts design alterations along a continuum, from houses that welcome visitors in wheelchairs to homes that fully accommodate residents with a wide range of disabilities. Smith is working with Webb and Williams on the second book, tentatively titled Just Below the Line: From Marginalization to Equity in Southern Housing. Slated for publication this spring, Inclusive Housing will explore in depth the concept of home and the impact of environment on disability. Numerous models and diagrams will showcase the housing prototypes developed by Smith and his students as exemplars of inclusive design. Boomers would be well advised to study the book closely. Along with an investment portfolio and health care plan, a well designed home can make aging comfortable and affordable — with no plywood ramps necessary.